The CFPB has two new disclosures that will replace four disclosures now being used. 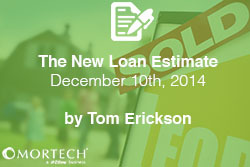 The Loan Estimate will replace the current Good Faith Estimate and initial Truth-in-Lending form and the new Closing Disclosure replaces the final Truth-in-Lending form and the HUD-1 Settlement statements. This change is effective “on” 8/1/2015---not before. The CFPB has done significant consumer testing, and have “simplified” the forms so that borrowers can more easily understand the information contained therein. 6) The new TIP’s (Total Interest Percentage) is the total estimated interest paid over the entire term of the loan as a percentage of the loan amount. The major drawback for Lenders is the considerable changes that have to be made to IT systems to support this new disclosure.